There are a number of internet communication tools available to healthcare professionals and patients, which could provide effective ways of managing patient’s conditions and make access to health professionals less practically demanding. Skype offers a potential way to allow patients to ‘access expertise’ of the healthcare professional as and when it is useful to them. 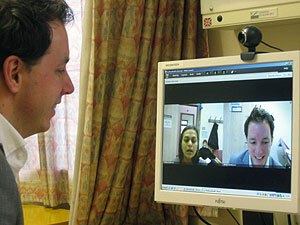 The VOCAL study will inform the implementation of clinician-patient consultations via Skype. We are conducting a series of in-depth qualitative studies of the interpersonal interactions via Skype, embedded in an organisational case study within NHS departments: diabetes and cancer surgery. The two year project started March 2015. The research is funded by the National Institute for Health Research NIHR (NIHR) and the Health Service and Delivery Research Programme. To define good practice and inform its implementation in relation to clinician-patient consultations via Skype and similar virtual media. What defines ‘quality’ in a virtual consultation and what are the barriers to achieving this? How is a successful virtual consultation achieved in an organisation whose processes and systems are mostly oriented to more traditional consultations? What is the national-level context for the introduction of virtual consultations? 2. Morris J, Campbell-Richards D, Wherton J, Sudra R, Vijayaragahavan S, Greenhalgh T, Collard A, Byrne E, O’Shea T. 2017. Webcam consultation for diabetes: findings from 4 years of experience in Newham. Journal of Practical Diabetes. 2017. Vol 34: 45-50. 3. Morris J, Campbell-Richards D, Wherton J, Shaw S, Vijayaragahavan S, Greenhalgh T, Sudra R, Collard A, Byrne E, O’Shea T. Virtual webcam clinics: Benefits and challenges. The Newham experience. Diabetes Care for Children & Young People. 2016 Vol 5 (3):105-110. 4. Vijayaragahavan S, O’Shea T, Campbell-Richards D, Sudra, R, Morris J, Byrne E, Greenhalgh T. DAWN: Diabetes Appointments via Webcam in Newham. British Journal of Diabetes & Vascular Disease. 2015. Vol 15, 123-126.